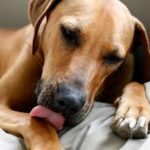 Dogs normally lick to clean an area on their fur when they are wet or have an itch, but if your dog is constantly licking at one area then you should check to see what’s getting their attention. 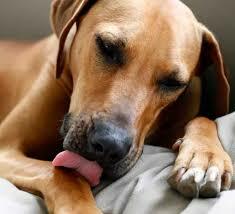 The skin can become red and swollen when excessively licked, and the cause needs to be diagnosed. It may be that the skin has been broken from a sharp object or impact, the pet may have been bitten by an insect causing a lump or painful rash, or something may have become lodged in the skin such as a prickle or grass seed. Perhaps there is a fungal or bacterial infection causing itchiness or it may be a food-related or flea allergy causing heat or hot spots to break out on the skin. Alternatively, there may be pain in an area of muscle or joint that is causing the dog distress and they are licking at the area to try to sooth the pain. It is important to have your dog checked for the cause of pain. Compulsive licking may also be a response to anxiety and stress. This may cause a rash, dry skin and/or loss of fur if left untreated. Many of these issues should be investigated by your vet and can be assisted with topical treatment, a minor procedure or medications. Bowen Therapy and Red Light Therapy can assist in the case of anxiety and improve lymphatic drainage for general well-being when recovering from allergies. In part two of this series we look at what causes panting and when it should be a cause for further investigation. Panting is a normal way for a dog to reduce its body temperature in hot weather or after exercise. It would be abnormal for breathing to be heavier and more labored than usual when a dog is not too hot.. This may be a sign that your dog is experiencing stress, pain, or another health issue that needs your vet’s attention. Activity increases body heat which induces a normal panting response. Dogs do not have sweat glands and cool themselves by panting. The evaporation of moisture from the tongue cools the blood at the surface, decreasing the dog’s temperature. Panting can also be a side effect of obesity. When an animal is overweight the heart and lungs struggle to bring oxygen to the increased amount of body tissue. An adrenalin response to fear or stress will increase the heart rate, and in turn the amount of oxygen required by the body, inducing an increase in panting. This may be a short-term response which decreases as the dog becomes calm, but if it’s ongoing it will require investigation and management. 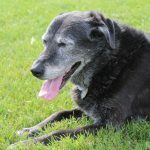 Older dogs with arthritis may have difficulty getting comfortable, which causes anxiety and rapid breathing. This can be accompanied by pacing due to discomfort. 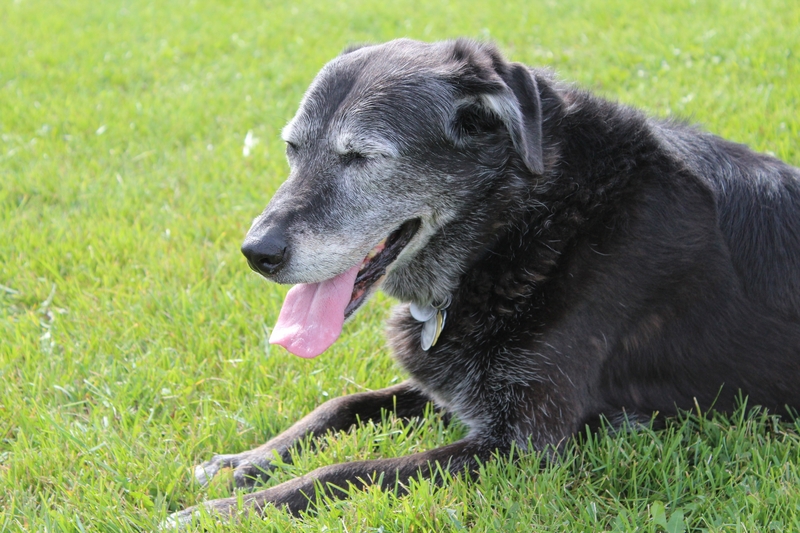 Aging dogs may also be on medication which can also cause panting. In severe cases heavy labored breathing may be a warning sign of life threatening conditions such as poisoning, heat stroke, heart failure, chest infection or fluid in or around the lungs. Our dogs cannot communicate to us their difficulties and persistent panting should never be dismissed and should be closely monitored and checked by your veterinarian. See how Bowen Therapy can help. Our pets are very important to us, they bring companionship, joy and love into our lives. They are our family members, and in many cases, our only significant other. The majority of pet owners seek to provide everything their beloved fur-kids need to keep them comfortable and healthy, ensuring they live long and happy lives. Pets cannot speak our language so it is up to us to watch for signs of discomfort, pain and illness. 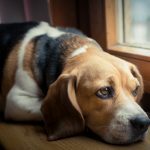 The most obvious are those abnormal actions we can easily identify, such as a limp indicating pain in a limb, or vomiting/diarrhea when a pet is ill. We might hear them crying, whining or yelping if they are distressed. 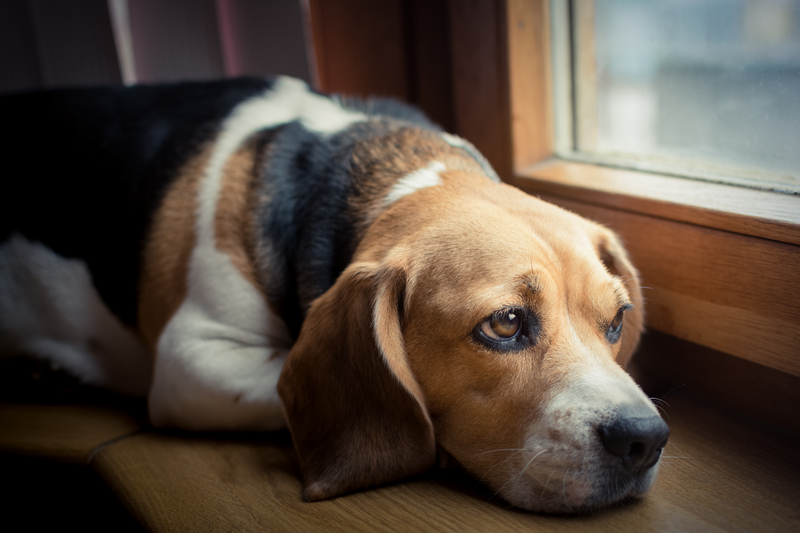 There are some more subtle changes that we may not recognize in our pet’s daily behavior which should be followed up with a Veterinarian to prevent potential serious health issues developing. This is the first in a series of blogs to help owners recognize the signs and what they might mean. Most of our pets love their food and if they suddenly stop eating the chances are there is something causing the pet to feel unwell. Perhaps they have an upset stomach, digestion problem or intestinal issue such as constipation or a urinary tract infection. They may be experiencing a reaction to a vaccination or medication. If in pain they may feel too distressed to want food or have difficulty getting out of bed to eat. There could be a dental problem such as inflamed gums (Gingivitis), plaque build-up, a broken tooth or an object stuck in the mouth making it painful for the pet to eat. Bad smelling breath can be a sign of dental issues or other more serious internal health problems. There may have been a change in the environment such as a family member leaving the home or another pet passed away? Have you added a new pet to the family? These changes can be stressful and a loss of appetite could result. If you have been feeding your pet excessive amounts of treats it may have just over eaten. Or, if you have made sudden changes to the diet your pet may not like the new food. Knowing your pet and recognizing changes means that you can get your Vet to assist with early diagnosis and treatment of any health issue. This may incorporate complementary therapies, such as acupuncture and Bowen Therapy and natural anti-inflammatory products. Our best mates need our help. We rely on them and they on us to watch, listen and take heed of their signals and respond with love and care. This is a question that I am often asked when talking with people who are unfamiliar with the concept of Bowen Therapy. The short answer is no, Bowen Therapy Technique is not massage. Both modalities are bodywork, complementary therapies that use touching or manipulation of the body tissue. They have common benefits relieving tension, pain and enabling healing, but are different in the their application and some outcomes.